As part of the ProXpress series of printers, the Samsung SL-M3820D is an entry-level single function monochrome printer that is easy to use and reliable for basic jobs. The compact build makes it easy to set up and install on just about any desktop, and ReCP technology enhances the legibility of text by sharpening edges and thin lines. The only problems are the lack of upgrades to make it faster and more reliable. The understated box-shaped design measures 366mm wide, 262.5mm deep, and 365.6mm tall, and weighs 9.86Kg. The simple control panel has a numeric keypad, eco button, and LED. The Samsung SL-M3820D runs on 128MB RAM with 600MHz processing speed. It easily connects to a computer via high-speed USB 2.0. Paper feeds from a 250-sheet default cassette and a single-sheet manual feeder. The output capacity is 150 sheets face-down. 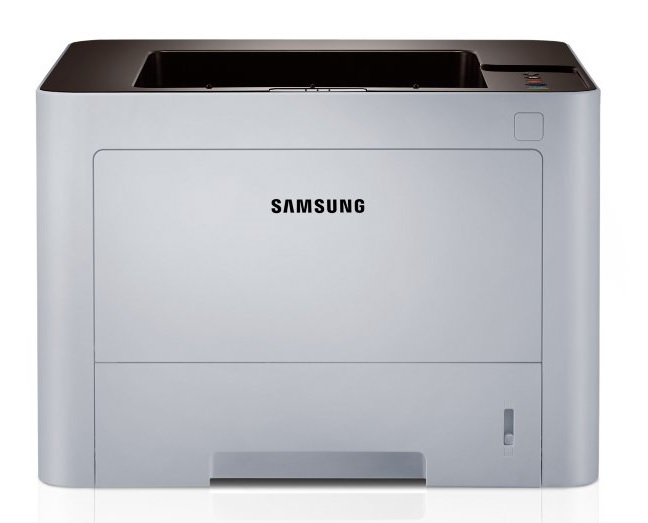 The Samsung SL-M3820D prints in speeds of up to 38ppm in A4, and it can produce double-sided documents automatically. The specialty paper feeder supports media that is up to 220gsm heavy. This printer’s one-touch eco button lowers paper, toner, and energy consumption. The Samsung SL-M3820D can be customised with the central print usage control system from the SyncThru admin job accounting feature to control usage. Enterprise-level security protects the privacy of sensitive documents. Parallel connectivity is optional, and the memory is not upgradeable. The Samsung SL-M3820D lacks network connectivity like Ethernet and Wi-Fi. There are no options to increase the paper capacity of the Samsung SL-M3820D.